Circle Holdings which operates Hinchingbrooke Hospital in Cambridgeshire, said its franchise is "no longer viable under current terms". The move comes amid pressure on the casualty department, Circle said. The hospital has also been placed in special measures following a recent Care Quality Commission inspection. The health watchdog announced on Friday it rated Hinchingbrooke "inadequate", highlighting particular concerns over accident and emergency and medical care. Prof Sir Mike Richards, the commission's chief inspector of hospitals, said: "We have given the trust an overall rating of 'inadequate' and I have made a recommendation the trust is placed into special measures. "Our inspection highlighted a number of serious concerns surrounding staffing and risks to patient safety particularly in the A&E department and medical care. "There were substantial and frequent staff shortages in the A&E department. There were a number of other areas of concern, some of which related to the way in which the trust is led and run." 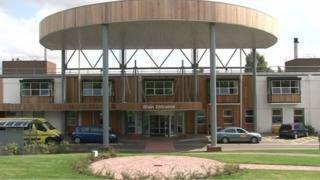 He added the findings "highlight the significant failings at Hinchingbrooke hospital". He said: "They are not a judgment on the role of the private sector in the NHS or on franchise arrangements. Where hospitals are failing to promote good care, we will say so regardless of who owns and runs them." Circle took on Hinchingbrooke in early 2012, as it faced closure. It said there had been unprecedented increases in accident and emergency attendances, a lack of care places for patients awaiting discharge, and that funding had been cut by 10.1% this financial year. Circle has made payments to the trust totalling about £4.84m and could be required to make a final support payment of approximately £160,000, the firm said. Under the terms of its 10-year contract, it has the right to end the franchise if the amount of money it has to put in to the trust exceeds £5m. Chief Executive Steve Melton said: "This combination of factors means we have now reluctantly concluded that, in its existing form, Circle's involvement in Hinchingbrooke is unsustainable." Circle chairman Michael Kirkwood said the decision had been made "with regret and after considerable thought". The GMB Union said the Circle takeover had been a "disaster waiting to happen when you get the private sector involved in running a hospital". Spokesman Steve Sweeney said: "It's not overly surprising to see them try to pack their bags, cut loose and walk away. "Obviously having the major backers walk away leaves [the hospital] in a very vulnerable position .... we're hoping that there's some planning in place to aid and assist that." A spokesman for the Department of Health said: "There will now be a "managed transfer of the running of the trust and patient care will not be affected." Jonathan Djanogly, Conservative MP for Huntingdon, said the way these contracts are issued "needs to be looked at". "I think probably Circle was too aggressive in terms of its pricing, but at the same time the NHS made Circle take all of the debts of the previous incarnation of the hospital," he said. Andy Burnham, the shadow health secretary, said: "Patients who rely on Hinchingbrooke will be worried about their hospital following this announcement. "It was the decision of the coalition in November 2011 to appoint Circle and they must take responsibility for this mess. "The government were explicitly warned two years ago about the risky business model Circle were operating, but failed to take any action." The company claimed it "remains a committed partner of the NHS at our elective treatment centres and independent hospitals", adding it is in discussion with the NHS Trust Development Authority to ensure an "orderly withdrawal". Circle runs private hospitals in Bath and Reading, which both accept NHS patients, and it also has NHS treatment centres in Bedfordshire and Nottingham. Can a private business run a hospital?